2016-09-08 Assigned to REVLON CONSUMER PRODUCTS CORPORATION reassignment REVLON CONSUMER PRODUCTS CORPORATION NOTICE OF RELEASE OF SECURITY INTEREST IN PATENTS Assignors: CITICORP USA, INC.
An emulsion hair bleach composition prepared by combining an aqueous oxidizing agent composition, a persulfate composition, and, optionally, a bleach oil composition, in amounts sufficient to provide a mixture containing an active oxygen concentration of about 3 to 5% by weight of the total mixture, a total alkalinity concentration of about 0.7-1.2 meq/gm., and 0.5-20% by weight of the total mixture of an oil having a solubility parameter of 5-12 (cal/cm3)1/2; an emulsion hair bleach composition capable of lightening hair in 10 to 30 minutes, and a kit for use in bleaching hair. (c) 0.5-20% by weight of the total mixture of an oil having a solubility parameter of 5-12 (cal/cm 3)1/2. In the example above, the oleic acid has preferentially reacted with monoethanolamine to form MEA-oleate, a soap, and is thus bound. The free hydroxyl groups dissassociated from the NH 4OH provide free alkalinity to the composition. The Hildebrand solubility parameters (δ) are generally available by referring to standard chemistry textbooks or similar reference manuals. The  Journal of the Society of Cosmetic Chemistry, Volume 36, pages 319-333, and Cosmetics and Toiletries, Vol. 103, October 1988, pages 47-69, both of which are hereby incorporated by reference in their entirety, list the Hildebrand solubility parameter (δ) values for a wide variety of cosmetic ingredients and how the solubility parameter is calculated. Suitable hydrophobic oils which have a Hildebrand solubility parameter (δ) ranging from about 5 to 12 include coconut oil, mineral oil, isopropyl myristate, linseed oil, octyl palmitate, and so on, and those listed in the above mentioned Journal articles. Oils which have solubility parameters which are significantly less than 5 are extremely hydrophobic, and while such oils may promote preferential absorption of the active ingredients into the hair shaft by causing the water soluble actives to “repel” the oil and be preferentially pushed into the hair shaft, they are difficult to disperse in the aqueous oxidizing agent composition because of their extreme lipophilic character. Oils which have Hildebrand solubility parameters which are significantly greater than 12 are too hydrophilic and will more readily form part of the water phase of the aqueous oxidizing agent composition. Accordingly, such oils will not induce preferential absorption of the water soluble active ingredients into the hair shaft as such active ingredients are compatible with the hydrophilic ingredients present in the composition. Examples of suitable carbohydrates include sugars such as glucose, sucrose, maltose, xylose, trehelose, and derivatives thereof, in particular sugar esters of long chain, C 14-30 fatty acids, as well as dextrins, cellulosics, and derivatives thereof. Also suitable are polyols such as glycerine or C 1-4 alkylene glycols and the like. Particularly preferred are C1-4 alkylene glycols, in particular propylene and/or butylene glycol and ethoxydiglycol. Preferably, in the copolymer used for the secondary thickening agent in the preferred embodiment of the invention, A and B are as above defined; and in the C monomer Z is (CH 2)m, m is 1-2, n is 2, and o is 2-100, and R is a C12-22 straight or branched chain alkyl. More preferably in the C monomer m is 1, n is 2, o is 10, and R is C18 or stearyl, and the compound is steareth-10 allyl ether/acrylate copolymer, which may be purchased from Allied Colloids under the tradename Salcare SC90. Also suitable is an aqueous solution of an acrylic polymer comprised of monomers A and B wherein A is selected from the group consisting of acrylic acid, methacrylic acid, and mixtures thereof, and B is selected from the group consisting of a C 1-22 alkyl acrylate, a C1-22 alky methacrylate, and mixtures thereof. Preferably, the A monomer comprises one or more of acrylic acid or methacrylic acid, and the B monomer comprises is selected from the group consisting of a C1-10, most preferably C1-4 alkyl acrylate, a C1-10, most preferably C1-4 alkyl methacrylate, and mixtures thereof. Most preferably the B monomer is one or more of methyl or ethyl acrylate or methacrylate. Most preferably, the acrylic copolymer is supplied in an aqueous solution having a solids content ranging from about 10-60%, preferably 20-50%, more preferably 25-45% by weight of the polymer, with the remainder water. The composition of the acrylic copolymer may contain from about 0.1-99 parts of the A monomer, and about 0.1-99 parts of the B monomer. Preferably, the acrylic copolymer contains enough of the A monomer to enable ionization in a basic solution, thereby causing the ionized carboxylic acid groups in the polymer to repel each other, and thereby “swallow” water. Particularly preferred acrylic copolymer solutions suitable for use in the developer composition include those sold by Seppic, Inc., under the tradename Capigel, in particular, Capigel 98, which is a white liquid having a pH of 2 to 4, a solids content of about 29-31, a density of 1.04 to 1.08, and a viscosity of 700-1000 millipascal seconds at 25° C.
where RCO is the carboxylic ester radical, X is hydrogen or lower alkyl, and n is the number of polymerized alkoxy groups. 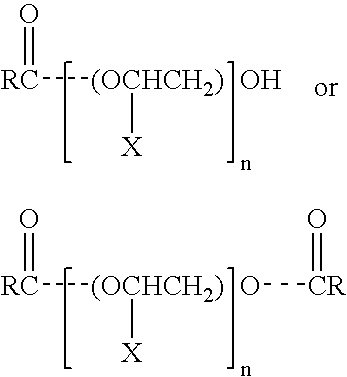 In the case of the diesters, the two RCO-groups do not need to be identical. Preferably, R is a C 6-30 straight or branched chain, saturated or unsaturated alkyl, and n is from 1-100. The invention will be further described in connection with the following examples, that are set forth for the purposes of illustration only. Samples 2, 3, and 7 do not contain a hydrophobic oil having a δ ranging from about 5 to 12 (cal/cm 3)1/2. Accordingly, it is seen that when the hydrophobic oil is not present the hair swatches exhibit inferior lightening when compared to the compositions where a hydrophobic oil having a δ ranging from about 5 to 12 is present. (c) about 0.5-20% by weight of the total mixture of an oil having a Hildebrand solubility parameter of 5-12 (cal/cm3)1/2. 2. The mixture of claim 1 wherein the active oxygen is provided by one or more of peroxide oxidizing agents or persulfates. 3. The mixture of claim 2 wherein the peroxide oxidizing agent comprises hydrogen peroxide. 4. The mixture of claim 2 wherein the persulfate comprises an alkaline earth metal persulfate, an alkali metal persulfate, an ammonium persulfate, or mixtures thereof. 5. The mixture of claim 1 wherein the active oxygen concentration is about 3.2 to 4.8% by weight of the total mixture. 6. The mixture of claim 1 wherein the total alkalinity is provided by one or more alkalizing agents. 7. The mixture of claim 6 wherein the alkalizing agents either alone or in combination have a pH ranging from about 7.5 to about 11.5. 8. The mixture of claim 7 wherein the alkalizing agent comprises one or more of an ionizable hydroxyl containing compound, amine, an inorganic salt, or mixtures thereof. 9. The mixture of claim 8 wherein the ionizable hydroxyl containing compound comprises ammonium hydroxide, sodium hydroxide, potassium hydroxide, or mixtures thereof. 10. The mixture of claim 8 wherein the amine is a primary amine. 11. The mixture of claim 10 wherein the amine is a C1-10 alkanolamine. 12. The mixture of claim 11 wherein the alkanolamine is monoethanolamine. 13. The mixture of claim 8 wherein the inorganic salt comprises an alkali metal silicate or alkaline earth metal silicate. 14. The mixture of claim 1 wherein the total alkalinity comprises a proportion of free alkalinity. 15. The mixture of claim 1 wherein the hydrophobic oil has a Hildebrand solubility parameter ranging from about 7 to about 9 (cal/cm3)1/2. 16. The mixture of claim 1 wherein the hydrophobic oil comprises coconut oil, mineral oil, isopropyl myristate, linseed oil, octyl palmitate, or mixtures thereof. 17. The mixture of claim 1 which is prepared by combining an aqueous oxidizing agent composition, a persulfate composition, and a bleach oil composition. 18. The mixture of claim 17 wherein the aqueous oxidizing agent composition comprises a solution or emulsion of hydrogen peroxide. 19. The mixture of claim 17 wherein the aqueous oxidizing agent composition is an emulsion. about 0.1-30% by weight of the total composition of an oily phase. 21. The mixture of claim 20 wherein the oily phase comprises silicone. about 5-60% of one or more particulate fillers. 23. The composition of claim 22 which is in the powdered form. 24. The composition of claim 22 which is in the cream or paste form. 25. The composition of claim 24 further comprising an oil which is a hydrophobic oil, a lipophilic ingredient or mixtures thereof. about 0.1-50% of one more more alkalizing agents. 27. The composition of claim 26 wherein the hydrophobic oil comprises coconut oil, mineral oil, isopropyl myristate, or mixtures thereof. 28. An emulsion hair bleach composition prepared by combining (i) an aqueous oxidizing agent composition, (ii) a persulfate composition, and (iii) a bleach oil composition containing at least one hydrophobic oil having a Hildebrand solubility parameter ranging from about 5 to 12 (cal/cm3)1/2; in amounts sufficient to provide a mixture capable of lightening the hair in ten to thirty minutes. 29. A kit for use in bleaching hair comprising three separate components, wherein the first component is an aqueous oxidizing agent composition, the second component is a persulfate composition, and the third composition is a bleach oil composition containing at least one hydrophobic oil having a Hildebrand solubility parameter ranging from about 5 to 12 (cal/cm3)1/2; wherein when said three components are mixed they provide a mixture that lightens hair in ten to thirty minutes. 30. The kit of claim 1 wherein the aqueous oxidizing agent composition comprises about 20-80% by weight of the total mixture, the persulfate composition comprises about 5-40% by weight of the total mixture, and the bleach oil composition comprises about 10-30% by weight of the total mixture. DE102015202189A1 (en) * 2015-02-06 2016-08-11 Henkel Ag & Co. Kgaa Blondiermittel with reduced oil separation "
ES2218760T3 (en) 2004-11-16 Hair dye compositions containing 2,3-dialkyl-4-aminophenol and 2-alkyl-1-naphthol. ES2320243T3 (en) 2009-05-20 Agent for the oxidative treatment, in particular shaped transparant gel. NL8800813A (en) 1988-11-01 Process for dyeing keratinous fibers with 5,6dihydroxyindool combined with an iodide composition, and a hydrogen peroxide at alkaline pH, as well as apparatus for use thereof. MXPA04000342A (en) 2005-04-25 Ready-to-use bleaching compositions, preparation process and bleaching process.